I never really liked the look of helmets. But I never really liked the look of rain pants, either, and I wear those. When we rode bikes in Copenhagen, we didn’t wear helmets, mostly because we got blank stares from the bike shop owners when we asked about renting them (they did, however, have helmets for the kids to rent). The blank stares reflected the fact that there is little reason to wear a helmet while riding a bicycle in Copenhagen, where there is extensive protected bicycle infrastructure and drivers know that hurting or killing someone who is not in a car would have consequences. Like losing a driver’s license. Pedestrians and bicycle riders in North America may now laugh bitterly. So I was delighted to discover that there was a helmet I would not be depressed to wear, by a Danish company no less, the Yakkay. It costs a freaking fortune, compared to other helmets, but honestly, even expensive helmets are not that expensive compared to other things, like, say, a tank of gas these days. The Yakkay does not look like a helmet. It looks like a goofy hat (see also the Lazer CityZen). My kids call my Yakkay the hat-helmet. It has some advantages over a traditional helmet; one of them is that like a hat, it provides ample sun protection. It can also be difficult to fit correctly, which is a hassle and annoying for an expensive helmet, but not really a long term kind of problem. My kids think my helmet looks goofy. I can't argue with that. What I did not anticipate when I started wearing this helmet is the widespread perception by the rest of the world that I wasn’t wearing a helmet at all, and “the rest of the world” includes bike shop owners. 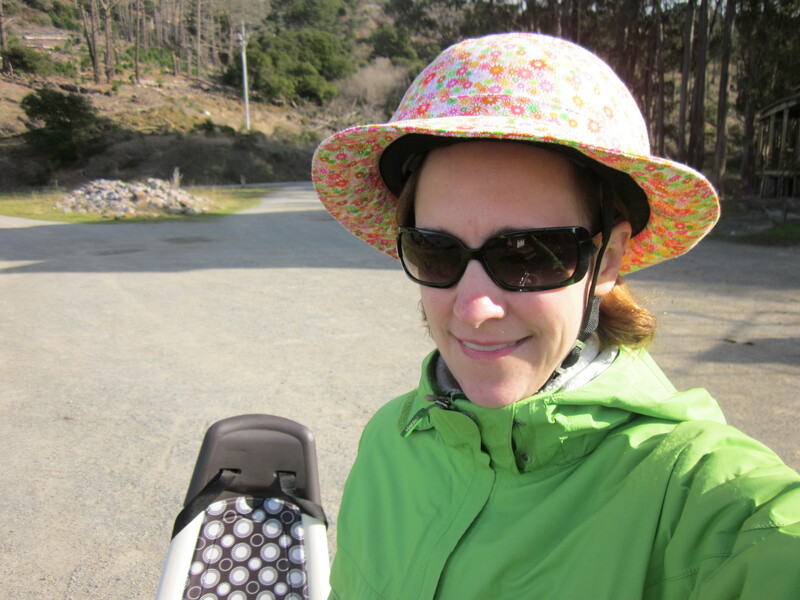 I get lots of compliments on my “hat,” and occasionally, I get dirty looks or comments about how I should be wearing a helmet if I’m riding with my kids. This IS a helmet, I say, rapping my knuckles on it. “OH!” is the typical reply. “That’s COOL!” But I have begun to realize there are a lot of people who pass judgment without bothering to ask. Why wear a helmet at all? My mother was surprised that this was actually a serious question. Of course bicycle riders should wear helmets, right? I don’t think it’s so clear-cut, but there are some reasons one could go either way. Why not? 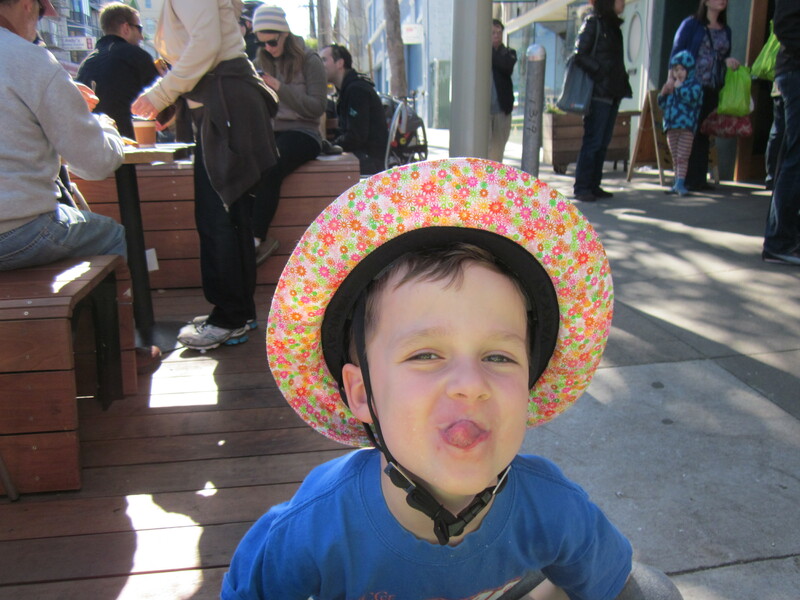 It’s not clear whether helmets are really that protective, relative to the costs. There’s no such thing as a risk-free activity, and we all make choices that balance cost, safety, and convenience. People may drive (less safe) instead of riding the bus (more safe); people eat processed food (less safe) rather than preparing food themselves (more safe); people cross against the light in the crosswalk or fail to make a complete stop at stop signs. Some people find the cost of purchasing and the inconvenience of remembering to carry a helmet not worth the potential increase in safety. Bicycling simply isn’t that dangerous in most circumstances, and helmets don’t protect against many of the likely risks. A culture that demands helmets make bike share programs much more difficult, and creates the perception that riding a bike is a dangerous thing to do, rather than just another form of transportation. Pedestrians and drivers don’t wear helmets, despite the fact that in some circumstances their need for them may be greater. My colleagues at SF General joke darkly that pedestrians in the city probably should be wearing helmets, at least in certain neighborhoods. Which brings me to the opposite question: why? The short answer to that question for me is that I don’t live in Copenhagen. In a city like San Francisco, where trauma physicians can make a serious argument that pedestrians should be wearing helmets to walk across the street, wearing a helmet while riding a bike starts to look pretty reasonable. I’m going faster than a pedestrian, so if I’m hit I’ll land harder, and I don’t have the same legal right-of-way. Not that that necessarily matters. Recently, while riding the university shuttle, I watched the driver mosey between two parked trucks into an intersection only to stop dead just before mowing down a man in a wheelchair. “Oh my god!” he cried. “I didn’t even see him!” Seriously? Dude, it is your JOB to drive safely enough that you don’t mow down people in wheelchairs in the crosswalk. But “I didn’t even see him” is the driver’s equivalent of the “Get Out Of Jail Free” card in Monopoly. It works when mowing down pedestrians and wheelchairs and it works when mowing down bicyclists. San Francisco, like a lot of cities, is undergoing a commuting shift. There are more bicycles on the road than there used to be, and there are, sadly, drivers who view that as an unacceptable imposition on the world that they were used to experiencing. With the protection of a two-ton vehicle, these drivers can express their opinions very dangerously indeed. That’s no reason to get off the road, but it does make me modify some of my choices. I don’t ride my bike on Masonic, for example, or any of the other streets in San Francisco that are widely recognized as high-speed arterials for driving. And I wear a helmet. My son's helmet has flames on it, and he'll wear it everywhere he can. There’s also the issue that although wearing helmets is optional (but encouraged) for adult riders in San Francisco, it is required for children. We are very fortunate that our children have never objected to wearing helmets, which is by no means a universal sentiment among the small. They like playing dress-up and we let them pick their own helmets (within their size range), and that helped. But part of the reason we’ve been so fortunate is that we ourselves wear helmets and have never given the impression that it’s an imposition or a hassle. It’s just something we do before we get on the bike, like checking the brakes or packing the lock. Many of the parents who have complained about their kids not wearing helmets admit that they themselves either don’t wear helmets or that they complain about it. We’d much rather wear helmets without complaint than risk not riding at all because our kids refuse to wear their helmets. 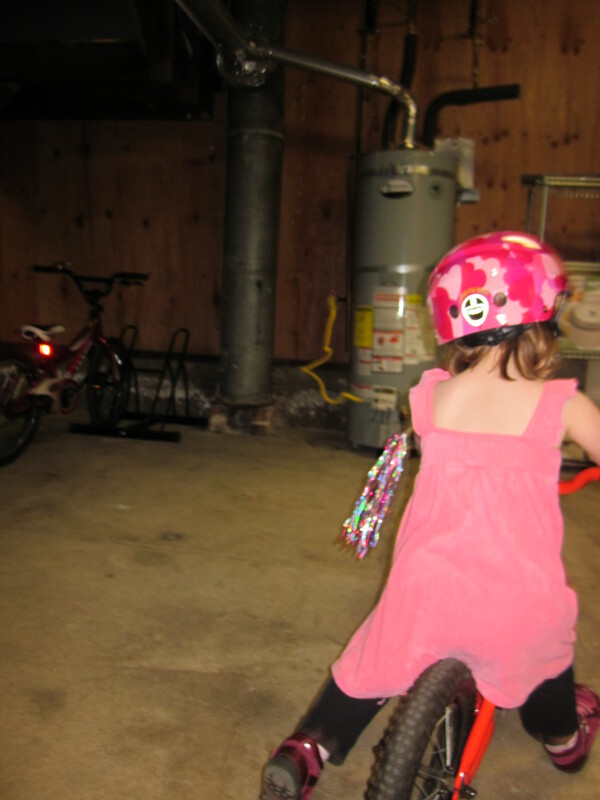 My daughter wears her helmet while practicing riding her balance bike in the basement, because it has pink hearts on it. I do a lot more stupid things to fit in and smooth our daily lives than wearing a helmet when I ride a bike. My helmet is either cute or goofy, depending on whom you ask, and it keeps the sun off my face, and that makes wearing it even less of a burden. It provides some extra protection against accidents (just as a helmet would for a pedestrian or driver), and weighed against the marginal imposition it makes on my life, I choose to wear the helmet every time. Other people make different choices based on their life circumstances, and I have zero problem with that. I don’t judge other riders for not wearing helmets, and I’ll defend their choice when it comes up in conversation with people whose knee-jerk response to seeing a bicycle rider without one is to call them crazy or stupid. That said, I won’t ride with adults who aren’t wearing helmets when I’m with my kids, as the idea that wearing helmets could be optional is a can of worms I am not ready to open with them. So I have this crazy hat-helmet, and in the tempest in a teapot that is the question of whether bicycle riders should wear helmets or not, I now get to experience the moral high ground and various minor inconveniences of wearing a helmet as well as the opprobrium of people who think I’m setting a bad example for my kids and risking my own life by not wearing a helmet at all. It is not something I expected when I bought the Yakkay, but I can live with that too. Knowing what I know now, I will not, however, ever buy their kids’ model, even though I think it’s super-cute. 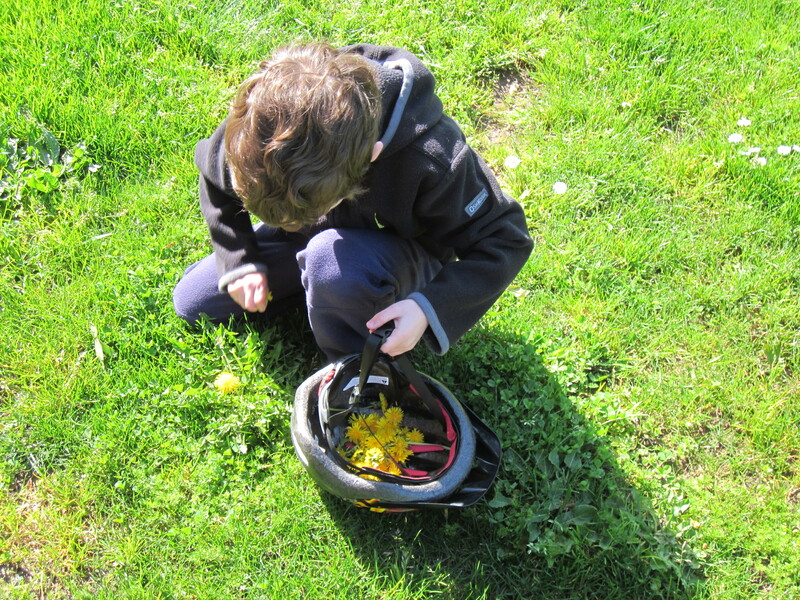 Helmets are also handy while picking dandelions in the park. I think that there are much bigger problems to worry about in North American cycling than helmets or the lack of them. 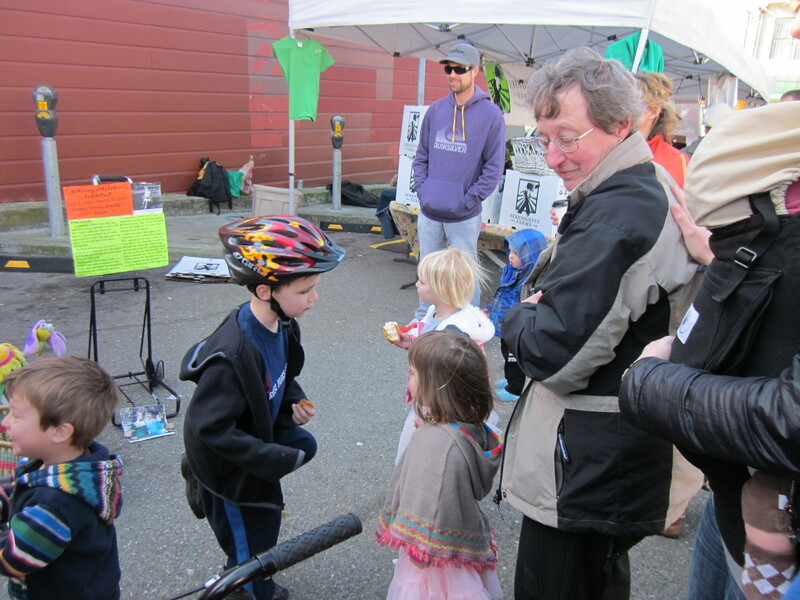 I find advocacy about helmets, whether pro or con, tiring. When cities in the US have the infrastructure to make cycling feel safer, like extensive protected bike lanes and stronger legal protections, I suspect that bicycle helmets will become a quaint relic of a more dangerous time, used only by certain specialists, much like chainmail. Until that happens, my feeling is that arguing about whether or not to wear helmets is like arguing about whether a red fire truck is more visible than a neon green fire truck. Maybe one color will make drivers pull over more quickly and thus help get the truck to its destination a little more quickly, but a better use of everyone’s time would be preventing the fire in the first place. Except that my daughter has complained about her helmet. I decided that commiserating and telling her that I wear mine anyway was the way to go. I’m curious if your helmet helps to keep rain out of your eyes? I was going to knit a little hat to go under my helmet to help keep my ears warm, and am considering adding a little brim to it to block the drops that sneak between my eyes and my glasses. My helmet keeps rain that is falling down vertically out of my eyes pretty effectively, but is hopeless when faced with rain+wind –> horizontal rain. I can’t really blame the technology for that, however; it’s hard to imagine any hat/helmet combination that could prevent sideways rain from getting in my eyes. I’m sure your hat would be super-cute, however. I suppose there’s always the Veltop! Having conceded all dignity, why not?